On Nov 28 Robin Hanson tweeted: “Good CS expert says: Most firms that think they want advanced AI/ML really just need linear regression on cleaned-up data” and this tweet went viral. Then Robin published more detail article “This AI Boom Will Also Bust“. 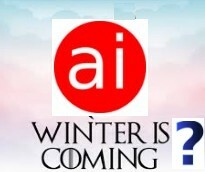 The majority of comments agree with Robin even saying that “another AI winter will come.” See a related article “Artificial Intelligence Is More Artificial Than Intelligent“. What is your opinion? This entry was posted in Artificial Intelligence, Trends. Bookmark the permalink.